Whoa. Hold the mayo. When did Amazon get rid of their infamous tab navigation? Was I asleep? Was I in a coma and missed the press release? 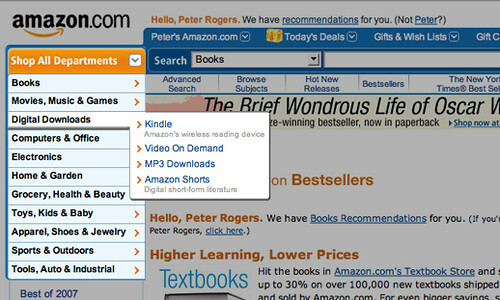 I'm not sure how IE 6 users see Amazon these days, but I'm seeing a vast improvement in this simple change. One of the most significant changes will be that people (clients?) won't be able to point to a major Web site and say, "they do it, so we can too." The tab metaphor is an extremely useful one, and as an interaction tool it is priceless. 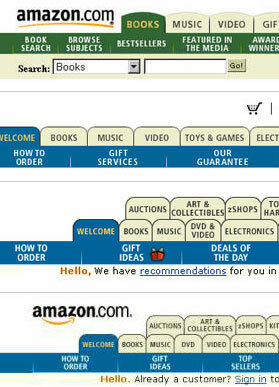 Yet, it is limited and Amazon was the clearest example of that (remember the stacked tabs?) despite that they may have been the primary reason for the popularity of tabs online (debatable I suppose). It's a relief to see Amazon finally drop the tab navigation, but there's still plenty of work to do.